Connected Wear – The Future of Fashion? Expressing yourself with fashion is no longer simply about deciding between sneakers and high heels or suit and jeans. Connected Wear enables you to express your mood or feelings in real time and thereby takes it to a completely new level. Technology brings feelings and fashion together as it is possible to buy clothes that make you feel connected with your loved ones over thousands of kilometers. 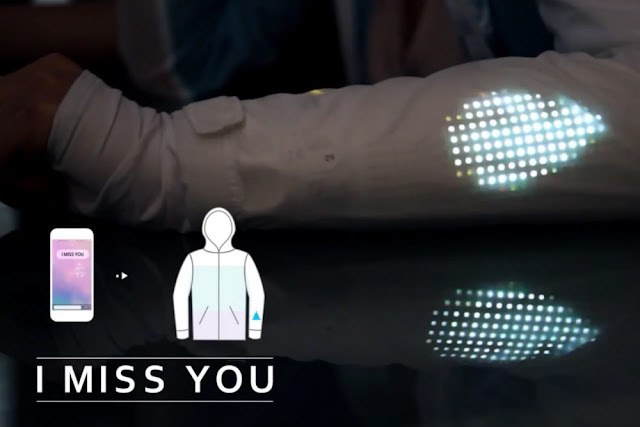 In this case Rapido Connected Wear, which belongs to Samsung Group, comes up with a set of jackets with which you can send emoticons and colors to one another by using the Smartphone App. This trend shows that romantic and digital can exist both together and - what is even more important - that fashion no longer "only" exists for our bodies but also for minds. Combined with technology fashion offers various possibilities nobody even thought about before. The future of fashion is full of creativity and added value! Read more about Rapido Connected Wear on psfk.com.